"Airship Capital of the World"
Map of Lakehurst in Ocean County. Inset: Location of Ocean County highlighted in the State of New Jersey. Lakehurst is a borough in Ocean County, New Jersey, United States. As of the 2010 United States Census, the borough's population was 2,654, reflecting an increase of 132 (+5.2%) from the 2,522 counted in the 2000 Census, which had in turn declined by 556 (-18.1%) from the 3,078 counted in the 1990 Census. Lakehurst was incorporated as a borough by an act of the New Jersey Legislature on April 7, 1921, from portions of Manchester Township, based on the results of a referendum held on May 24, 1921. The borough is named for its location near lakes and woods. The community of Lakehurst first reached international fame as a winter resort around the turn of the 20th century, following the opening of the Pine Tree Inn in 1898. In 1911, the rope factory in the town burned down, prompting the formation of a volunteer fire department. The Hindenburg disaster, occurred on May 6, 1937, the German zeppelin Hindenburg arriving from Frankfurt am Main caught fire at the Lakehurst Naval Air Station, which is located in Manchester Township (not in the borough of Lakehurst). According to the United States Census Bureau, the borough had a total area of 1.008 square miles (2.610 km2), including 0.915 square miles (2.370 km2) of land and 0.093 square miles (0.240 km2) of water (9.20%). The borough's lake, Lake Horicon, existed prior to 1942, as clearly shown in aerial photographs from 1940 and 1931 and topographical maps from 1912. The cedar water lake remains stream-fed. Lakehurst is completely surrounded by Manchester Township, making it part of 21 pairs of "doughnut towns" in the state, where one municipality entirely surrounds another. The climate in this area is characterized by hot, humid summers and generally mild to cool winters. According to the Köppen Climate Classification system, Lakehurst has a humid subtropical climate, abbreviated "Cfa" on climate maps. As of the 2010 United States Census, there were 2,654 people, 881 households, and 661.631 families residing in the borough. The population density was 2,900.8 per square mile (1,120.0/km2). There were 943 housing units at an average density of 1,030.7 per square mile (398.0/km2). The racial makeup of the borough was 77.24% (2,050) White, 10.81% (287) Black or African American, 0.64% (17) Native American, 2.11% (56) Asian, 0.23% (6) Pacific Islander, 3.65% (97) from other races, and 5.31% (141) from two or more races. Hispanic or Latino of any race were 13.07% (347) of the population. There were 881 households out of which 36.8% had children under the age of 18 living with them, 50.7% were married couples living together, 16.7% had a female householder with no husband present, and 24.9% were non-families. 18.5% of all households were made up of individuals, and 4.2% had someone living alone who was 65 years of age or older. The average household size was 3.01 and the average family size was 3.43. In the borough, the population was spread out with 28.4% under the age of 18, 10.1% from 18 to 24, 29.4% from 25 to 44, 25.2% from 45 to 64, and 7.0% who were 65 years of age or older. The median age was 31.9 years. For every 100 females there were 105.4 males. For every 100 females ages 18 and older there were 97.8 males. The Census Bureau's 2006-2010 American Community Survey showed that (in 2010 inflation-adjusted dollars) median household income was $67,872 (with a margin of error of +/- $8,972) and the median family income was $67,838 (+/- $7,173). Males had a median income of $44,844 (+/- $8,788) versus $34,950 (+/- $7,557) for females. The per capita income for the borough was $27,171 (+/- $4,950). About 2.1% of families and 3.7% of the population were below the poverty line, including 0.0% of those under age 18 and 9.4% of those age 65 or over. As of the 2000 United States Census there were 870 households (662 of which were families of two or more) in the borough making up the total population of 2,522. The population density was 2,733.9 people per square mile (1,058.4/km2). There were 961 housing units at an average density of 1,041.7 per square mile (403.3/km2). The racial makeup of the borough was 84.22% White, 7.85% African American, 0.63% Native American, 2.34% Asian, 0.08% Pacific Islander, 2.74% from other races, and 2.14% from two or more races. Hispanic or Latino of any race were 7.97% of the population. There were 870 households out of which 41.4% had children under the age of 18 living with them, 57.5% were married couples living together, 13.4% had a female householder with no husband present, and 23.9% were non-families. 19.8% of all households were made up of individuals and 6.6% had someone living alone who was 65 years of age or older. The average household size was 2.90 and the average family size was 3.33. In the borough the population was spread out with 30.6% under the age of 18, 8.0% from 18 to 24, 34.1% from 25 to 44, 19.4% from 45 to 64, and 8.0% who were 65 years of age or older. The median age was 32 years. For every 100 females, there were 106.6 males. For every 100 females age 18 and over, there were 100.3 males. The median income for a household in the borough was $43,567, and the median income for a family was $48,833. Males had a median income of $35,403 versus $26,667 for females. The per capita income for the borough was $18,390. About 4.4% of families and 7.1% of the population were below the poverty line, including 7.6% of those under age 18 and 2.5% of those age 65 or over. 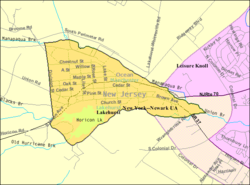 Lakehurst is governed under the Borough form of New Jersey municipal government. The governing body consists of a Mayor and a Borough Council comprising six council members, with all positions elected at-large on a partisan basis as part of the November general election. A Mayor is elected directly by the voters to a four-year term of office. The Borough Council consists of six members elected to serve three-year terms on a staggered basis, with two seats coming up for election each year in a three-year cycle. The Borough form of government used by Lakehurst, the most common system used in the state, is a "weak mayor / strong council" government in which council members act as the legislative body with the mayor presiding at meetings and voting only in the event of a tie. The mayor can veto ordinances subject to an override by a two-thirds majority vote of the council. The mayor makes committee and liaison assignments for council members, and most appointments are made by the mayor with the advice and consent of the council. As of 2016[update], the Mayor of Lakehurst Borough is Republican Harry Robbins, whose term of office ends December 31, 2019. Members of the Lakehurst Borough Council are Council President Steven Oglesby (R, 2019), Robin Busch (R, 2017), Stephen F. Childers (R, 2019), James W. Davis Jr. (R, 2018), Patricia A. Hodges (R, 2017) and Gary L. Lowe (R, 2018). In August 2015, the Borough Council selected former mayor Stephen F. Childers to fill the unexpired term ending in December 2016 of Glenn McComas, who had resigned from office the previous month as he was moving out of the borough. Lakehurst is located in the 4th Congressional District and is part of New Jersey's 10th state legislative district. Prior to the 2011 reapportionment following the 2010 Census, Lakehurst had been in the 9th state legislative district. For the 116th United States Congress, New Jersey's Fourth Congressional District is represented by Chris Smith (R, Hamilton Township). New Jersey is represented in the United States Senate by Democrats Cory Booker (Newark, term ends 2021) and Bob Menendez (Paramus, term ends 2025). For the 2018–2019 session (Senate, General Assembly), the 10th Legislative District of the New Jersey Legislature is represented in the State Senate by James W. Holzapfel (R, Toms River Township) and in the General Assembly by Gregory P. McGuckin (R, Toms River Township) and David W. Wolfe (R, Brick Township). The Governor of New Jersey is Phil Murphy (D, Middletown Township). The Lieutenant Governor of New Jersey is Sheila Oliver (D, East Orange). Ocean County is governed by a Board of Chosen Freeholders consisting of five members, elected on an at-large basis in partisan elections and serving staggered three-year terms of office, with either one or two seats coming up for election each year as part of the November general election. At an annual reorganization held in the beginning of January, the board chooses a Director and a Deputy Director from among its members. As of 2019[update], Ocean County's Freeholders (with party affiliation, term-end year, residence and department directorship listed in parentheses) are Freeholder Director Virginia E. Haines (R, 2019, Toms River; Parks and Recreation and Natural Lands), Freeholder Deputy Director John P. Kelly (R, 2019, Eagleswood Township; Law and Public Safety), Gerry P. Little (R, 2021, Surf City; Roads), Gary Quinn (R, 2021, Lacey Township; Human Services and Transportation) and Joseph H. Vicari (R, 2020, Toms River; Senior Services and County Operations). Constitutional officers elected on a countywide basis are County Clerk Scott M. Colabella (R, 2019, Barnegat Light), Sheriff Michael Mastronardy (R, 2019; Toms River) and Surrogate Jeffrey Moran (R, 2023, Beachwood). As of March 23, 2011, there were a total of 1,373 registered voters in Lakehurst, of which 254 (18.5%) were registered as Democrats, 295 (21.5%) were registered as Republicans and 823 (59.9%) were registered as Unaffiliated. There was one voter registered to another party. Among the borough's 2010 Census population, 51.7% (vs. 63.2% in Ocean County) were registered to vote, including 72.2% of those ages 18 and over (vs. 82.6% countywide). In the 2012 presidential election, Democrat Barack Obama received 50.8% of the vote (438 cast), ahead of Republican Mitt Romney with 48.5% (418 votes), and other candidates with 0.7% (6 votes), among the 872 ballots cast by the borough's 1,480 registered voters (10 ballots were spoiled), for a turnout of 58.9%. In the 2008 presidential election, Republican John McCain received 49.5% of the vote (459 cast), ahead of Democrat Barack Obama with 47.7% (443 votes) and other candidates with 1.7% (16 votes), among the 928 ballots cast by the borough's 1,521 registered voters, for a turnout of 61.0%. In the 2004 presidential election, Republican George W. Bush received 58.8% of the vote (518 ballots cast), outpolling Democrat John Kerry with 39.8% (351 votes) and other candidates with 0.8% (12 votes), among the 881 ballots cast by the borough's 1,427 registered voters, for a turnout percentage of 61.7. In the 2013 gubernatorial election, Republican Chris Christie received 73.4% of the vote (398 cast), ahead of Democrat Barbara Buono with 25.1% (136 votes), and other candidates with 1.5% (8 votes), among the 555 ballots cast by the borough's 1,461 registered voters (13 ballots were spoiled), for a turnout of 38.0%. In the 2009 gubernatorial election, Republican Chris Christie received 65.0% of the vote (371 ballots cast), ahead of Democrat Jon Corzine with 25.4% (145 votes), Independent Chris Daggett with 7.4% (42 votes) and other candidates with 1.1% (6 votes), among the 571 ballots cast by the borough's 1,469 registered voters, yielding a 38.9% turnout. The Lakehurst School District serves students in public school for pre-kindergarten through eighth grade at Lakehurst Elementary School. As of the 2014-15 school year, the district and its one school had an enrollment of 525 students and 33.8 classroom teachers (on an FTE basis), for a student–teacher ratio of 15.5:1. Public school students from Lakehurst in ninth through twelfth grades attend Manchester Township High School in Manchester Township, as part of a sending/receiving relationship with the Manchester Township School District. As of the 2014-15 school year, the high school had an enrollment of 997 students and 88.3 classroom teachers (on an FTE basis), for a student–teacher ratio of 11.3:1. The Lakehurst district decided in 2012 against a proposal that would have had borough students attend Jackson Liberty High School as part of a sending / receiving relationship with the Jackson School District. The change in the sending relationship had been considered as a means of reducing the costs associated with paying $14,000 for each of the 150 students attending Manchester High School, as opposed to the $11,300 that would have been paid at Jackson, yielding annual savings of $400,000, less the added cost of transporting students to and from Jackson. As of May 2010[update], the borough had a total of 13.55 miles (21.81 km) of roadways, of which 7.72 miles (12.42 km) were maintained by the municipality, 3.95 miles (6.36 km) by Ocean County and 1.88 miles (3.03 km) by the New Jersey Department of Transportation. New Jersey Route 70 is the main highway through the borough, which lies at the western end of New Jersey Route 37. County Route 547 connects from the North after paralleling the eastern edge of the Lakehurst Maxfield Field portion of Joint Base McGuire-Dix-Lakehurst. Ocean Ride local service is provided on the OC1A Whiting Express and the OC2 Manchester routes. Lakehurst is located on the former Central Railroad of New Jersey Southern Division Main Line. The Barnegat Branch formerly extended from Lakehurst through Toms River and Beachwood down to Barnegat. Lakehurst is being considered as the southern terminus of the planned NJ Transit Monmouth-Ocean-Middlesex Line, which would closely follow the CNJ line. The Asbury Park Press provides daily news coverage of the community as does WOBM-FM radio. The government of the borough provides columns and commentary to The Manchester Times, which is one of seven weekly papers from Micromedia Publications; founded in 1995, the company is headquartered on Union Avenue in the borough. See also: Category:People from Lakehurst, New Jersey. Thomas Barlow (1896–1983), one of the first professional basketball players, he was inducted as a member of the Basketball Hall of Fame in 1981. Rich Croushore (born 1970), former Major League Baseball pitcher who was born in Lakehurst when his father served in the U.S. Navy. Abel Kiviat (1892–1991), silver medalist in the men's 1,500 m event at the 1912 Summer Olympics. Juice Newton (born 1952), Grammy Award-winning American pop music and country singer. Richard Shindell (born 1960), folk singer / songwriter. ^ a b Governing Body, Borough of Lakehurst. Accessed May 12, 2017. ^ E-Mail Contacts, Borough of Lakehurst. Accessed July 26, 2016. ^ a b 2012 New Jersey Legislative District Data Book, Rutgers University Edward J. Bloustein School of Planning and Public Policy, March 2013, p. 49. ^ U.S. Geological Survey Geographic Names Information System: Borough of Lakehurst, Geographic Names Information System. Accessed March 7, 2013. ^ a b c "DataUniverse - 2010 Census Populations: Ocean County", Asbury Park Press. Accessed December 26, 2012. ^ a b c d e f DP-1 - Profile of General Population and Housing Characteristics: 2010 for Lakehurst borough, Ocean County, New Jersey, United States Census Bureau. Accessed December 26, 2012. ^ a b c Profile of General Demographic Characteristics: 2010 for Lakehurst borough, New Jersey Department of Labor and Workforce Development. Accessed December 26, 2012. ^ a b GCT-PH1 Population, Housing Units, Area, and Density: 2010 - State -- County Subdivision from the 2010 Census Summary File 1 for New Jersey, United States Census Bureau. Accessed December 26, 2012. ^ Look Up a ZIP Code for Lakehurst, NJ, United States Postal Service. Accessed December 26, 2012. ^ Area Code Lookup - NPA NXX for Lakehurst, NJ, Area-Codes.com. Accessed August 28, 2013. ^ Table 7. Population for the Counties and Municipalities in New Jersey: 1990, 2000 and 2010, New Jersey Department of Labor and Workforce Development, February 2011. Accessed December 26, 2012. ^ Snyder, John P. The Story of New Jersey's Civil Boundaries: 1606-1968, Bureau of Geology and Topography; Trenton, New Jersey; 1969. p. 203. Accessed October 26, 2012. ^ Hutchinson, Viola L. The Origin of New Jersey Place Names, New Jersey Public Library Commission, May 1945. Accessed September 2, 2015. ^ Chronology of Lakehurst History Archived October 17, 2013, at the Wayback Machine, Borough of Lakehurst. Accessed October 17, 2013. ^ Lake Horicon Park Archived July 24, 2011, at the Wayback Machine, Borough of Lakehurst. Accessed July 13, 2013. ^ Areas touching Lakehurst, MapIt. Accessed August 10, 2015. ^ Report on Population of the United States at the Eleventh Census: 1890. Part I, p. 239. United States Census Bureau, 1895. Accessed October 20, 2016. ^ Barnett, Bob. Population Data for Ocean County Municipalities, 1850 - 2000, WestJersey.org, January 6, 2011. Accessed December 26, 2012. ^ Fifteenth Census of the United States : 1930 - Population Volume I, United States Census Bureau, p. 718. Accessed December 26, 2012. ^ a b c d e Census 2000 Profiles of Demographic / Social / Economic / Housing Characteristics for Lakehurst borough, New Jersey Archived May 17, 2014, at the Wayback Machine, United States Census Bureau. Accessed December 26, 2012. ^ a b c d e DP-1: Profile of General Demographic Characteristics: 2000 - Census 2000 Summary File 1 (SF 1) 100-Percent Data for Lakehurst borough, Ocean County, New Jersey, United States Census Bureau. Accessed December 26, 2012. ^ DP03: Selected Economic Characteristics from the 2006-2010 American Community Survey 5-Year Estimates for Lakehurst borough, Ocean County, New Jersey, United States Census Bureau. Accessed December 26, 2012. ^ 2017 Municipal Data Sheet, Borough of Lakehurst. Accessed May 11, 2017. ^ 2017 Ocean County & Municipal Elected Officials, Ocean County, New Jersey Clerk, updated February 22, 2017. Accessed May 12, 2017. ^ Borough of Lakehurst, Ocean County, New Jersey. Accessed May 12, 2017. ^ 2016 General Election Official Results November 8, 2016, Ocean County, New Jersey Clerk, updated November 16, 2016. Accessed January 30, 2017. ^ 2015 General Election Official Results November 3, 2015, Ocean County, New Jersey Clerk, updated November 10, 2015. Accessed July 26, 2016. ^ General Election November 4, 2014, Ocean County, New Jersey Clerk, updated November 12, 2014. Accessed July 26, 2016. ^ Staff. "Childers Replaces McComas", The Manchester Times, August 7, 2015. Accessed August 10, 2015. "The Lakehurst Borough Council unanimously voted in former mayor Stephen Childers as Glenn McComas' replacement. McComas resigned July 1 due to his moving from the borough. The term expires December 31, 2016." ^ 2017 New Jersey Citizen's Guide to Government, p. 59, New Jersey League of Women Voters. Accessed May 30, 2017. ^ 2011 New Jersey Citizen's Guide to Government, p. 59, New Jersey League of Women Voters. Accessed May 22, 2015. ^ Biography, Congressman Chris Smith. Accessed January 3, 2019. "Elected in 1980, U.S. Rep. Chris Smith (R-Hamilton, N.J.) is currently in his 19th two-year term in the U.S. House of Representatives, and serves residents of the Fourth Congressional District of New Jersey." ^ District 10 Legislators, New Jersey Legislature. Accessed January 22, 2018. ^ Freeholder History, Ocean County, New Jersey. Accessed January 25, 2015. ^ Freeholder Director Virginia E. Haines, Ocean County, New Jersey. Accessed January 4, 2019. ^ Freeholder John P. Kelly, Ocean County, New Jersey. Accessed January 25, 2015. ^ Freeholder Gerry P. Little, Ocean County, New Jersey. Accessed January 25, 2015. ^ Freeholder Gary Quinn, Ocean County, New Jersey. Accessed January 4, 2019. ^ Freeholder Joseph H. Vicari, Ocean County, New Jersey. Accessed January 25, 2015. ^ Board of Chosen Freeholders, Ocean County, New Jersey. Accessed January 25, 2015. ^ County Directory, Ocean County, New Jersey. Accessed January 25, 2015. ^ County Clerk, Ocean County, New Jersey. Accessed January 25, 2015. ^ Biography of Scott M. Colabella, Office of the County Clerk. Accessed January 25, 2015. ^ Sheriff Michael Mastronardy, Ocean County Sheriff's Office. Accessed January 25, 2015. ^ County Surrogate Jeffrey W. Moran, Ocean County, New Jersey. Accessed January 25, 2015. ^ 2015 Elected Officials of Ocean County, Ocean County, New Jersey. Accessed January 25, 2015. ^ a b Voter Registration Summary - Ocean, New Jersey Department of State Division of Elections, March 23, 2011. Accessed December 26, 2012. ^ GCT-P7: Selected Age Groups: 2010 - State -- County Subdivision; 2010 Census Summary File 1 for New Jersey, United States Census Bureau. Accessed December 26, 2012. ^ "Presidential General Election Results - November 6, 2012 - Ocean County" (PDF). New Jersey Department of Elections. March 15, 2013. Retrieved December 24, 2014. ^ "Number of Registered Voters and Ballots Cast - November 6, 2012 - General Election Results - Ocean County" (PDF). New Jersey Department of Elections. March 15, 2013. Retrieved December 24, 2014. ^ 2008 Presidential General Election Results: Ocean County, New Jersey Department of State Division of Elections, December 23, 2008. Accessed December 26, 2012. ^ 2004 Presidential Election: Ocean County, New Jersey Department of State Division of Elections, December 13, 2004. Accessed December 26, 2012. ^ "Governor - Ocean County" (PDF). New Jersey Department of Elections. January 29, 2014. Retrieved December 24, 2014. ^ "Number of Registered Voters and Ballots Cast - November 5, 2013 - General Election Results - Ocean County" (PDF). New Jersey Department of Elections. January 29, 2014. Retrieved December 24, 2014. ^ 2009 Governor: Ocean County, New Jersey Department of State Division of Elections, December 31, 2009. Accessed December 26, 2012. ^ District information for Lakehurst Elementary School District, National Center for Education Statistics. Accessed December 7, 2016. ^ About Our District, Manchester Township School District. Accessed May 12, 2017. "We are also the receiving district for approximately 150 high school students from neighboring Lakehurst Borough." ^ Manchester Township High School 2016 Report Card Narrative, New Jersey Department of Education. Accessed May 12, 2017. "Manchester Township High School is a four-year comprehensive high school that serves the students of Manchester Township and Lakehurst." ^ School data for Manchester Township High School, National Center for Education Statistics. Accessed December 12, 2016. ^ Martins, Andrew. "Plan to put Lakehurst pupils in JLHS dies" Archived October 17, 2013, at Archive.today, Tri-Town news, November 29, 2012. Accessed November 22, 2014. "Recent consideration regarding the possibility of students from neighboring Lakehurst being enrolled at Jackson Liberty High School in Jackson on a tuition basis is dead.The Lakehurst School District Board of Education voted Nov. 20 not to proceed with a plan that could have ended that district's long-standing agreement with the Manchester School District in which high school-age students who live in Lakehurst attend Manchester High School." ^ Ocean County Mileage by Municipality and Jurisdiction, New Jersey Department of Transportation, May 2010. Accessed July 18, 2014. ^ Ocean County Bus Service, Greater Mercer TMA. Accessed August 10, 2015. ^ Ocean Ride Rider's Guide, Ocean County, New Jersey. Accessed August 10, 2015. ^ Ocean County Transit Guide, Ocean County, New Jersey. Accessed August 10, 2015. ^ Monmouth-Ocean-Middlesex, NJ Transit. Accessed November 22, 2014. ^ About Us, Micromedia Publications. Accessed June 27, 2016. "Micromedia Publications, Inc. was founded in 1995 by Stewart Swann and Robyn Weber for the purpose of publishing high quality local weekly newspapers within New Jersey. Following the successful launch of The Manchester Times in April of that year, the company has since introduced The Berkeley Times (1996), The Jackson Times (2000), The Brick Times (2002), The Howell Times (2004), The Toms River Times (2005) and The Lacey Barnegat Times (2010), now The Southern Ocean Times (2013)." ^ Staff. "Bird: $15 Million Over 7 Years", Los Angeles Times, September 28, 1983. Accessed February 12, 2011. "Thomas B. Barlow, a member of the Basketball Hall of Fame and a pioneer of professional basketball, died at a retirement home in Lakehurst, NJ." ^ Rich Croushore, Baseball-Reference.com. Accessed February 12, 2011. ^ Capozzi, Jose. "60 Seconds", The Palm Beach Post, March 1, 2013. Accessed October 17, 2013. "JC: Besides being the birthplace of Rick Croushore, what else is Lakehurst, N.J., famous for? RC: (smiles) For the Hindenberg blowing up. JC: As a Lakehurst native, how much is that ingrained in your conscious?RC: It's not. I was born there when my dad was in the Navy. We moved." ^ Litsky, Frank. "Abel Kiviat, Runner, Dies at 99; Held World 1,500-Meter Record", The New York Times, August 26, 1991. Accessed December 26, 2012. "Abel Kiviat, a former world-recordholder in the 1,500-meter run who won a silver medal in the 1912 Olympics, died Saturday afternoon at his home in Lakehurst, N.J. He was 99 years old." ^ Staff. "SQUEEZE IN A CONCERT, JUICE NEWTON, GARY PUCKETT TO TAKE STAGE AT OLDIES SHOW", Aberdeen American News, September 4, 2008. Accessed December 26, 2012. "Born Judy Kay Cohen in Lakehurst, NJ, she grew up in Virginia Beach, Va."
^ "TAKE FIVE: juice newton", Las Vegas Sun, January 2, 2007. Accessed January 2, 2008. "Newton, a 54-year-old native of Lakehurst, NJ, performs Friday through Sunday". ^ Condran, Ed. "Heavy Hitters", Asbury Park Press, October 31, 2008. Accessed February 12, 2011. "If Richard Shindell had realized he was climbing over the faces of the Mount Rushmore of songwriting while finding material for his latest album, "South of Delia," the disc might have sounded dramatically different. The Lakehurst native, co-headlining Saturday with Glen Phillips at Monmouth University in West Long Branch, interprets some heavy hitters." 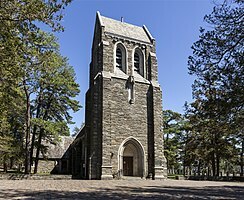 Wikimedia Commons has media related to Lakehurst, New Jersey. This page was last edited on 7 March 2019, at 22:57 (UTC).